Well, this is the best dish for the bachelor's and freshers to start with. 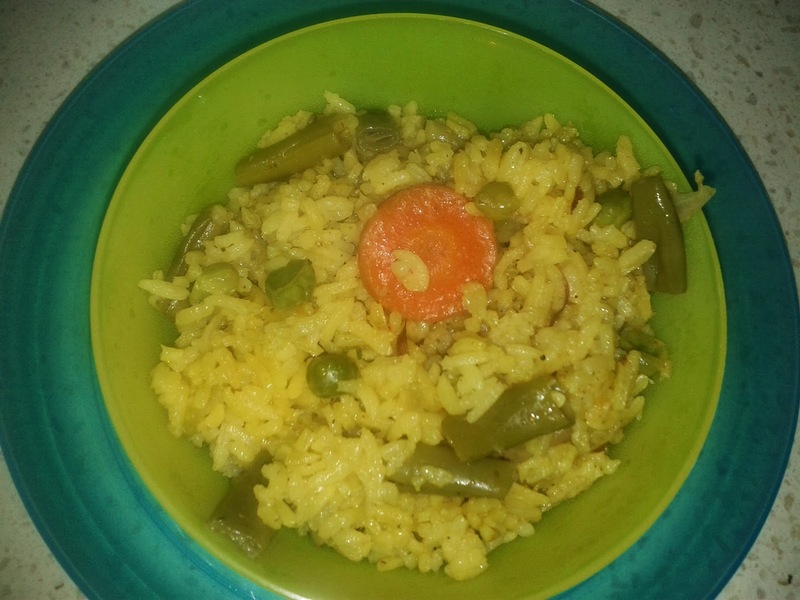 I had previously posted a recipe for white vegetable pulao but this is bit different from it in terms of color as well as taste. This is my mother's recipe. It takes less time and also fills your stomach. I will be using green chutney, which can be prepared and stored in fridge for a week or two and can be used for other dishes also. Can add any vegetables of your choice or can try with chicken, mutton or egg also . Need not have to use exactly the same vegetables what I have used. You can cut the vegetables to the shape you want. Optional - Can use coriander leaves at the end to garnish. I am non adding exactly 2 glass water for 1 glass rice grains so as to prevent it from getting overcooked. If you like it to be overcooked or if you are scared to add less water or if you are trying to cook rice using not exactly twice the amount of water for the first time then you can follow the ratio that you always use. Tip : Although, rinsing and soaking rice grains is not necessary, it does help to lighten the grain. Soaking times can be from 5-30 minutes. The longer the soaking, the shorter the cooking time. Can add lime water while adding rice grains or on opening the lid after whistles. Wash and drain the rice grains. Take a cooker. 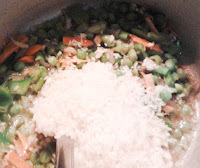 Add oil / ghee. Once the oil / ghee heats up. Add Green chutney and chopped onions. Fry it until the color slightly changes to brown. Add salt, turmeric powder and garam masala powder. Now add vegetables one by one and fry them for 2-3 minutes. At this time you will get a nice aroma of vegetable flavors. Add rice grains and fry it along with vegetables in the oil / ghee for 2-3 minutes. 4. Add water and check the salt. 5. Add lime water and close the lid and keep the stove on high flame. 6. Wait for 1-2 whistles. Open the lid after it cools and serve it when hot.